Miniature Enthusiasts of the South Shore: October meeting of MESS - lavender tutorial! October meeting of MESS - lavender tutorial! We had our first MESS meeting in a few months this afternoon at Mary-Anne's place. 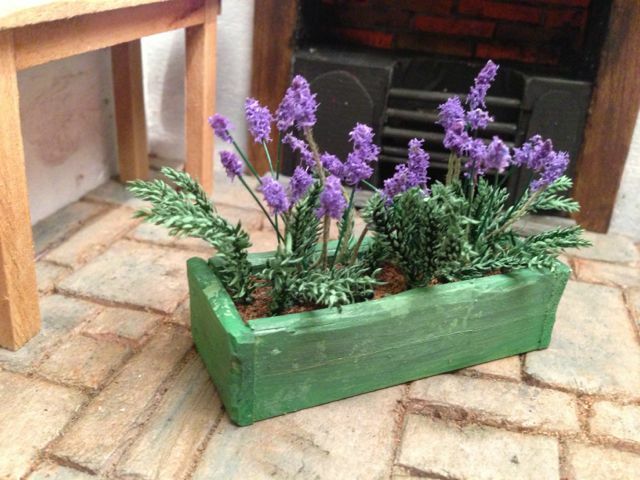 Mary-Anne and I shared our Camp Mini Ha Ha projects with Paula and then we worked on making 1/12 scale lavender. For the foliage, you need something bushy with lots of detail. I saw someone else's suggestion that one use lycopodium, which is also known as ground pine, princess pine and club moss. I couldn't find a Canadian distributor (although it seems easily available in the States, they won't ship it to Canada) so I bought a Christmas tree kit from Silly Sisters in the Netherlands which comes with a bag of the stuff! I'd love to find an alternative, but this works quite well. 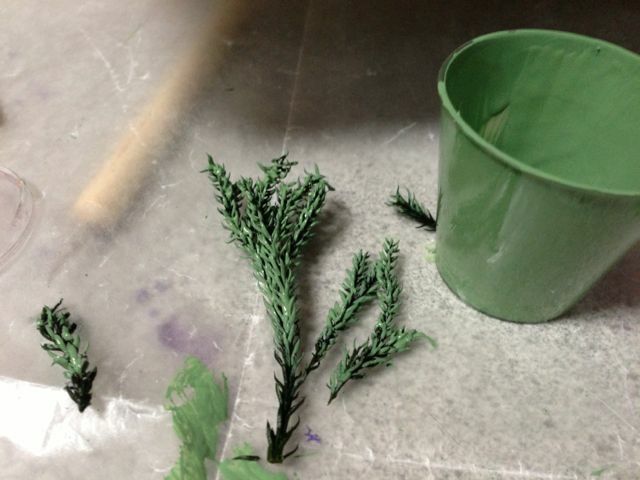 Lavender foliage is a greyed green, so you'll probably have to paint it. This was very easily done -- much more easily than I thought! I just brushed on a thin, watery mixture and it dried quite quickly. 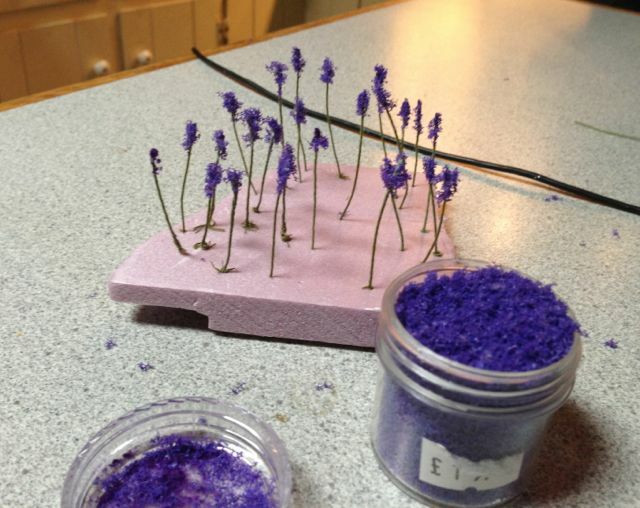 While your foliage is drying, make the lavender flower clusters. These are easy! You'll need thin green wire (paddle wire works, or thin green wrapped florist's wire) in lengths from 1" to 2" or so. You need lavender coloured material for the blossoms: you have a number of options here, from Flower Soft (which is acid free) to flocking to no hole beads. We used a mixture of Soft Magic by Carole's Crafts (which is compressed shredded foam material I found in England -- I believe it's pretty much a rip off of Flower Soft) and a darker purple flocking I had found in a dollar store. You can also make your own flocking by shredding fabric until it's the texture you like. Whatever you use, make sure it's shredded as finely as you need for the scale and in a disposable dish. Take your length of wire, dip one end in white craft glue and then dip it into the shredded flower material. I then rolled each flower head so that it was shaped fairly tightly into a small flower cluster, long than it was wide. If you look at an actual lavender bloom, some have a long flowered area and some are short. I love this tut, thank you for sharing it. 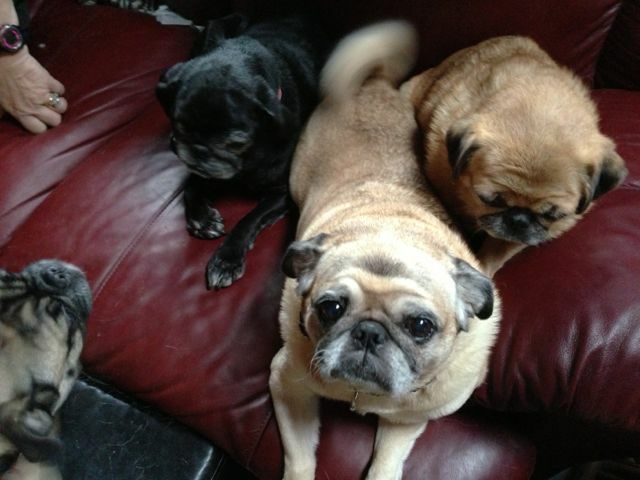 Love your pugs, they look like my little Nikita, she is a Pikinese and has the same kind of face except mine's nose is barely there. Well, how clever is that! Here in western Oregon, there's a plant called prince's pine, which is surely what you're calling princess pine (why it should be called either I have no idea--after "The Little Prince," perhaps. Lavender is a very common yard shrub here, as is rosemary, which is a darker green than lavender, although I think it would be more likely to shed. 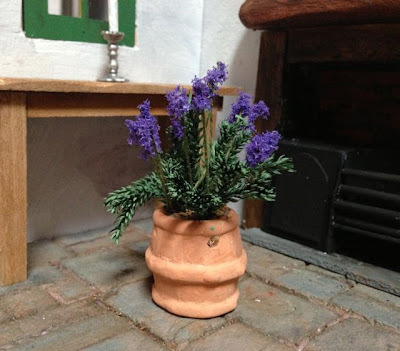 We are a group of miniaturists living on the South Shore of Nova Scotia. If you'd like to join us, please get in touch by emailing Mary-Anne at lakelodge1 [at] hotmail.com We meet once a month near Bridgewater, and welcome new members.